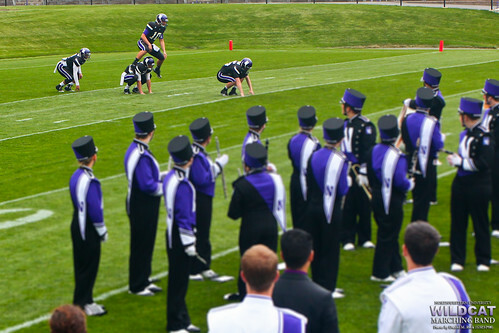 SEPTEMBER 16, 2013 — EVANSTON, ILL. — "We're playing six performances in seven days," says Daniel J. Farris, director of athletic bands at Northwestern University. Tonight, a sold-out crowd at the United Center will welcome the Northwestern University "Wildcat" Marching Band at the Chicago Blackhawks' 2013 Training Camp Festival. 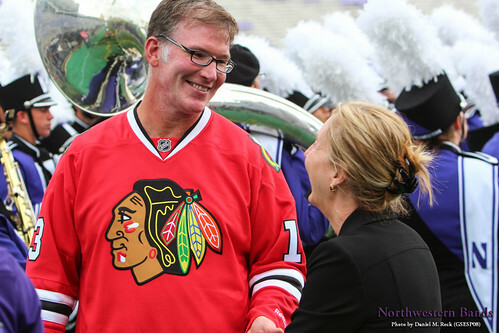 This just over a week after the Blackhawks' Jim Cornelison sang the national anthem with the Wildcat Band during the home opener at Ryan Field. "There will be around 90 NUMBers there to play between the action of the Blackhawks scrimmage," says Farris. Fans with general admission tickets may enter through gates 3, 6 and 7 on Madison St. and Adams St. starting at 5 p.m. Those participating in the "Mad Dash to Madison" 5K run/10K skate event will enter at gate 2. The first 10,000 fans to arrive at United Center will receive a Jonathan Toews bobblehead. More information about tonight's event has been posted on the Chicago Blackhawks' website. "This event sells out every year," says Farris. 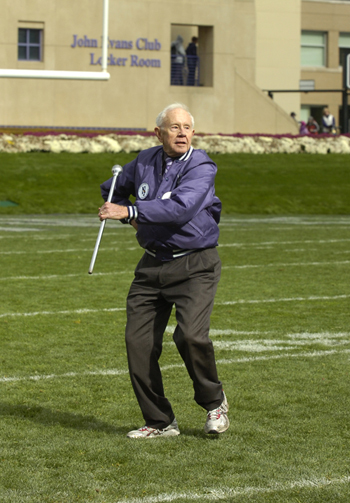 AUGUST 20, 2013 — EVANSTON, ILL. — For more than six decades, Glenn Opie (WCAS50) entertained Northwestern University homecoming crowds as he spun and tossed his drum major's mace. Over the years, he lead hundreds of NUMBALUMS as they growled and high-stepped onto Ryan Field. After the games, fans would swarm him, asking for autographs and a photo with him. Before becoming a Wildcat celebrity — and before becoming a successful lawer in Great Bend, Kans. — he led the Northwestern University "Wildcat" Marching Band in the 1949 Rose Bowl parade. "The constant roar of the crowd again brought back the Rose Bowl memory — giddiness and euphoria," Opie said of his NUMBALUMS performances. Opie's contributions on the gridiron were not limited to Northwestern's football stadium. He went on to become director of the Argonne Rebels Drum and Bugle Corps, sharing leadership with his wife, Sandra. Under their guidance, the corps won the American Legion national championships in 1971, 1972, and 1973. The Rebels were one of the thirteen founding corps of Drum Corps International, which now includes 42 corps providing an educational and competitive performance experience to thousands of high schoolers each year. The husband and wife team were inducted into the Drum Corps International hall of fame. June 1, 2013 — EVANSTON, ILL. — "This is a really fun event that features lots of purple and NU coaches in attendance," says Northwestern University Director of Althetic Bands Daniel J. Farris of tomorrow's third-annual Northwestern Day at Arlington Park. The event, beginning at 11:15 a.m., will recognize the academics, athletics and pride of Chicago's Big Ten Team with unique and special events for fans of all ages. "Many NU coaches are on hand and there is special NU race which we play for," says Farris. 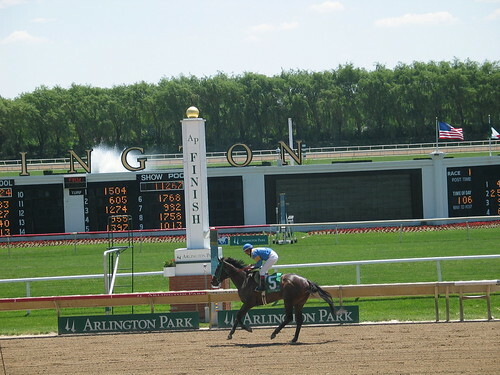 While world class horses and their jockeys speed around the Arlington Park track, several of Northwestern's top coaches will be on hand to meet-and-greet with fans throughout race day. The Northwestern University "Wildcat" Marching Band, WildPride and Willie the Wildcat will also be at the park for special performances and photo opportunities. "The band will play at the park entrances at 1:00 p.m., then the National Anthem after Race 2," says Farris. APRIL 4, 2013 — EVANSTON, ILL. — Northwestern University football fans don't need to wait until the fall to start cheering their Wildcats. This Saturday, April 6, fans are invited to a free open-to-the-public practice session at Ryan Field on the Evanston campus at 10 a.m. The day also marks the kick-off of the 2013 performance season of the Northwestern University "Wildcat" Marching Band as they entertain fans from the stadium stands. "This is always a fun event and a great way to get fired up for next fall!" says Daniel J. Farris, Northwestern's director of athletic bands. FEBRUARY 12, 2013 — EVANSTON, ILL. — "I'm excited for the opportunity to welcome new members and provide a sense of belonging to members of NUMB," says Elisabeth Sladek (WCAS16), one of two new drum majors who will helm the Northwestern University "Wildcat" Marching Band for the 2013-2014 season. Her new partner on the podium is Fritz Burgher (J14), who is in Washington, D.C., this term participating in the Medill on the Hill journalism program. "As soon as I get back, I'll be jumping right in and will begin planning for a season to remember," he says. Of course, that seasons starts, well, now. 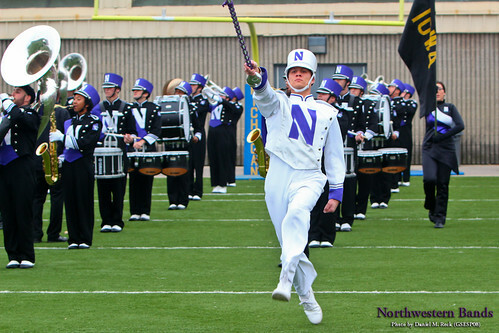 The new drum majors' first performance will be at the Northwestern Spring Football Exhibition on April 13. They will be joining up with returning drum major Will Ritter (WCAS14), who will begin his second season in the white-and-silver uniform. The experience has changed him. Moving NUMB to the Gator Bowl: How Do They Do It?